On Thursday, after resting and late arrival, we visited some important museums in Barcelona. Among them, Museu Picasso, Museu Nacional d’Art de Catalunya, Museu d’Historia de Catalunya must be visited. 10,000 people can visit at the same time when it is finished. The construction plan burned down during the civil war. It is still built with the help of people. Gaudí did not want the highest tower of the basilica which is 170 m, above the highest point in Barcelona which is 172 m.
In the basilica, there are no smooth walls. The numbers he puts in the basilica when they are added vertically and horizontally are always 33. They say that he was so crazy about this work that he died in a train accident when he went to see the basilica from afar. 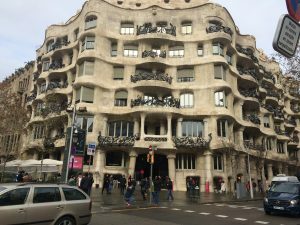 After the Basilica of Sagrada Familia we carried on with Gaudí’s last work: La Casa Milà. This building that looks like the waves of the sea was built entirely with natural stones. From its terrace you can enjoy the view of Barcelona. Admission: € 16.50.
portant work of Gaudí is Casa Battlò. Gaudí again uses his unique style. Through the windows it seems to me like a house of elves and with the colours that this building has, I simply love it. Not only on the outside but inside also has a very fantastic style. If you want to see inside of this strange work by Antoni Gaudi, the entrance fee is € 23.50.
mbla. This is a very large street that goes to the promenade where Barceloneta beach is. 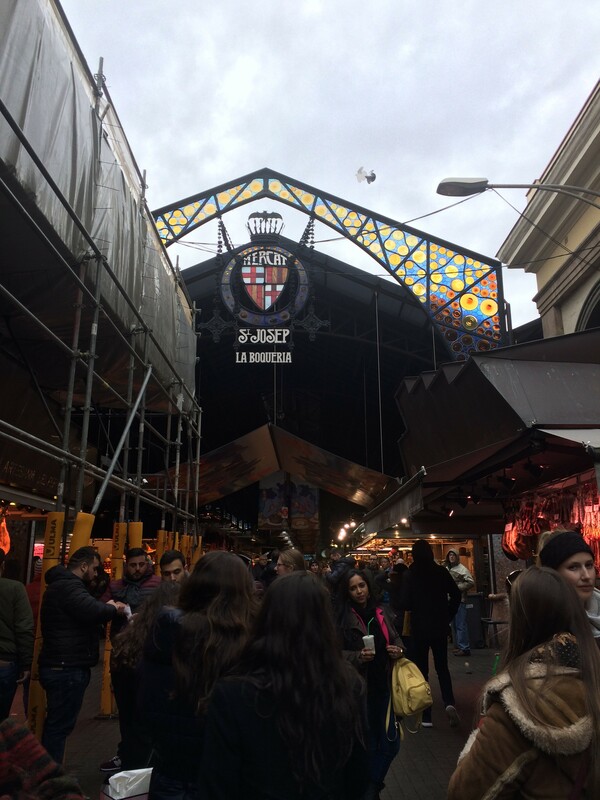 La Rambla is a good place to buy gifts for your family and your friends because it is full of gift shops. Almost all the owners of these stores that I went into were foreigners. So, you can see the amount of immigration that Barcelona has. Walking along this street towards the sea you will find on the left a very large market called La Boqueria. Here you can buy different tropical fruits and other things from distant countries, chocolates, sweets and fish. It’s time to go home and rest! After walking 17 km, the next day you wake up more rested. Today we visited Parque Güell and the entrance fee is € 7. This place that was built for the Güell family has at the entrance two similar houses and one with a small tower. The buildings of this park are formed of colours and mosaics. The stairs at the entrance go out to squares with the accompaniment of some columns. The square is really a huge balcony where you can see all of Barcelona and the sea and you can sit on the benches and take advantage of the view of Barcelona. If you go to this park in the summer, keep in mind that you must take some hats and water to protect yourself from the sun because you are going to spend a lot of time in this wonderful place. ve here satisfied, but you discover that you are starving. We ate fast so as not to waste time in a restaurant, we ate typical dishes such as Escalivada and Calcots. Then we continue again with the Rambla and go to the Barceloneta beach passing the statue of Colon.